That Grant's sweater will not have to be thrown out that is. I remade the first sleeve using 10s instead of 7s and got a lot more length out of the same amount of yarn. It wasn't quite as much as I needed. 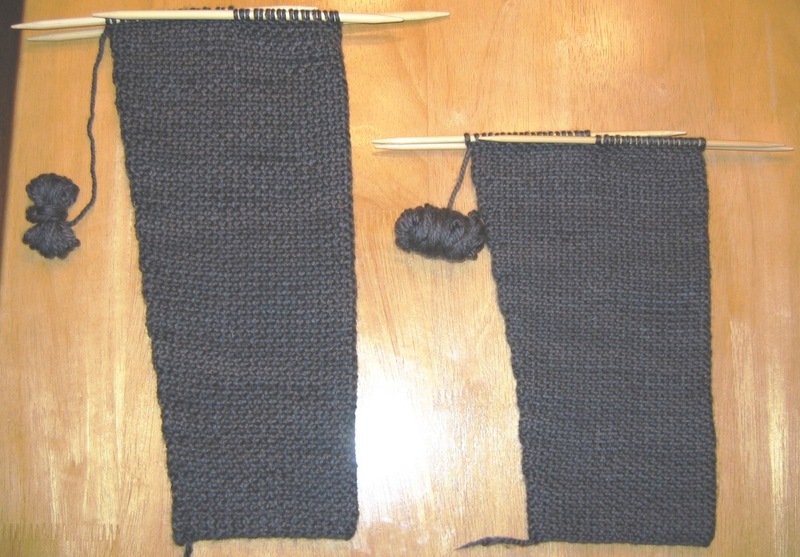 But, since I had enough black for the body to begin with, getting to the same point in the new gauge will mean that I'll have leftover yarn to redistribute to the sleeves. 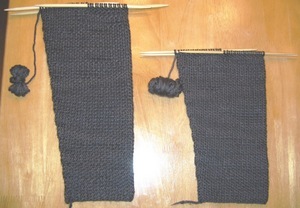 Check out sleeve 1 vs 2 for yourself; I can't believe how much more distrance I got from upsizing the gauge. It's much drapier now too, so I figure it will wear more comfortably. Though I'm cursing the work ahead of me, I think (as with every previous frogging) that the end product will be better for it. The Babymoon was not only relaxing, but conducive to knitting too. I finished Alyssa's Christmas hat (an Odessa from MagKnits) and I finished the commissioned socks I'm making in exchange for yarn. I've also managed to upload a picture of Charlotte's sweater. As she came out rather tiny I fear it will not fit her for a while. But that's ok, living near the beach a light cardigan is always a good thing to throw on a baby in the evenings. I'm excited to test this! Thank You! This page contains a single entry by published on December 11, 2006 5:04 PM. Babymoon! was the previous entry in this blog. Tired Brain is the next entry in this blog.